Pretty, small white flowers in June followed by showy, bright red, autumn berries. This upright evergreen or semi-evergreen shrub forms a lovely tree with weeping branches when grown as a standard as it is here. 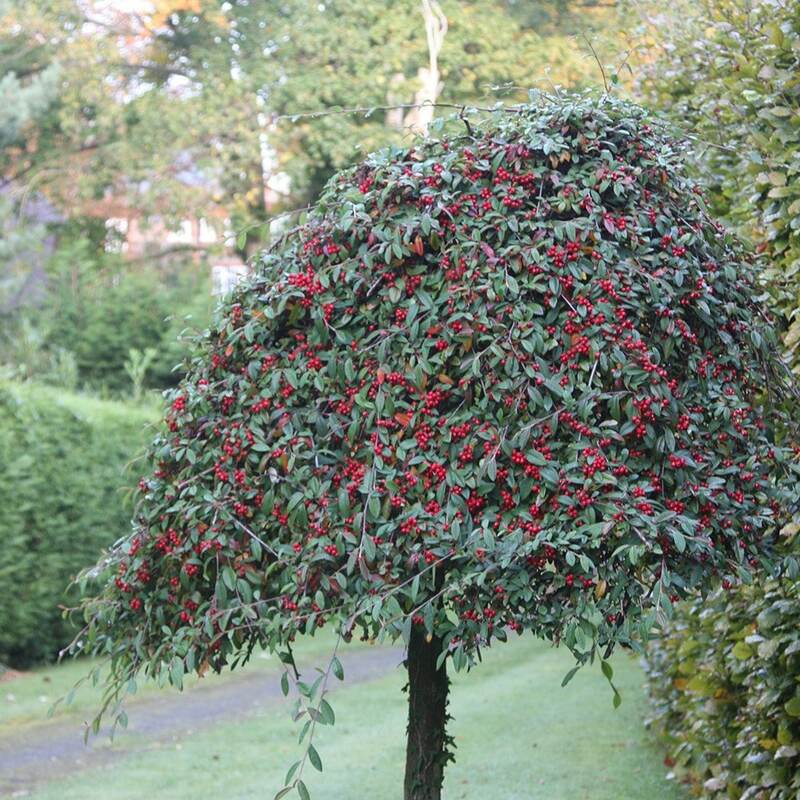 Like most Cotoneasters, it can tolerant a wide range of conditions including dry soil. Garden care: In late spring or early summer after flowering lightly cut back any branches that spoil the symmetry of the plant and apply a generous 5-7cm (2-3in) mulch of well-rotted garden compost or manure around the base of the plant. In autumn trim back lightly any branches that obscure the display of fruit. 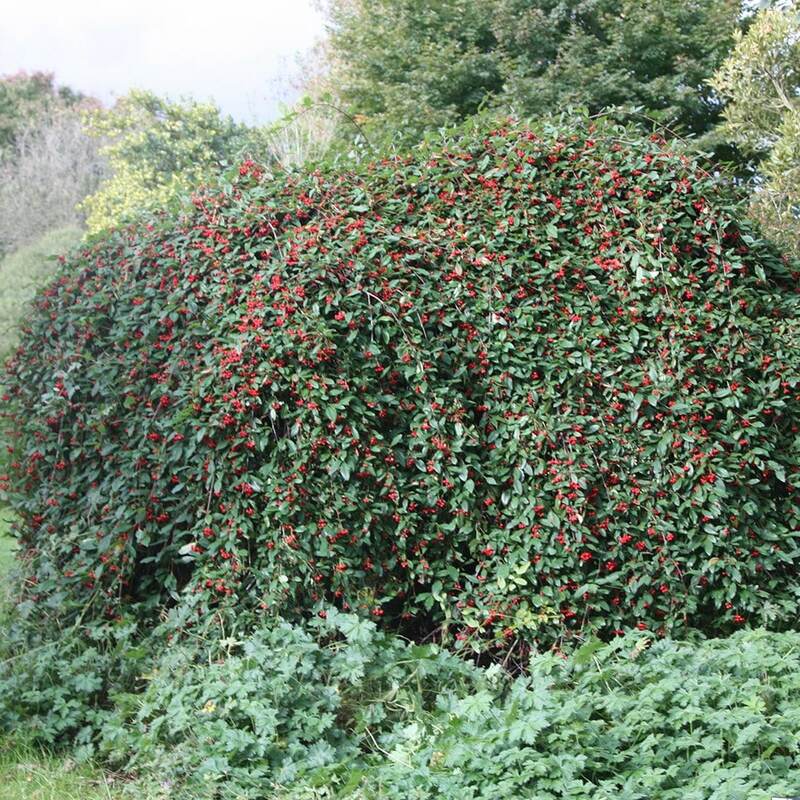 Will this standard cotoneaster be okay planted into the garden or will it lose it's shape and become an ordinary bush? Hello, This plant has been top-grafted onto a clear stem, so (provided it is kept free of shoots emerging from the rootstock) it should always maintain its shape. I live on a first floor balcony 30ft long 8ft at its widest. Love this tree could I grow it in a large pot? Need to bring birds up here. Hello there Yes as long as it is planted up into a good sized pot, something like a 50-60cm diameter pot in a John Innes no 3 compost, and it is kept well watered and fed. My standard cotoneaster tree was planted 10 yrs ago looks like it is dying. Normally this time of year its starting to produce flowers and looking a lot healthier. Help! Hello, It is difficult to know why this might be happening without a bit more information. Has there been any changes to its surroundings, or are there any signs of pests and diseases? Perhaps you could have a look for these and then send us some photos so we can have a look. Can you please tell me how tall are these plants when supplied? Hello, These plants are currently around 1.5 - 1.8m tall. Hi I bought this from you a few years ago, this year I have noticed two shoots from the base, the leaves on these shoots are a lot larger than those on the main tree - Are these suckers which should be removed? If they are suckers does this mean the tree may be under stress or is this natural? Thank you for your time. Hello, These plants are top grafted (ie the top part of the plant is grafted to the top of the stem), so anything coming from the base should be removed as soon as it appears. It is not unusual for this to happen, but if you do not remove them as they appear, they will take over. Just moved house and we we have a small wildlife pond underneath a cotoneaster Hybridus Pendulus. The berries keep falling into the pond - will they poison the wildlife, or am I okay to try and scoop out as many as I can each year? Worst case scenario, do I need to chop down the tree? Also, could I put fish into the pond, or is that a huge no-no? Suggestions for planting low maintenance border please Hello, I recently had my garden extended by a piece of land measuring 34 metres by 14 metres, and my son purchased 23 Phormiums from you in last August on my behalf. I was delighted with the service I received, and the plants appear to be thriving well especially considering the dreadful weather we have suffered this winter. We also bought Rootgrow from you to assist with their development ,and also for use when we moved mature Acers and other shrubs. I still need more shrubs or other types of plants and would appreciate some advice as to what to use. Along one of the 14 metre lengths there is a "hedge" of bamboo plants, and adjacent to these on the return (long) length there is a small rise of earth, tapering down to ground level, with a specimen black bamboo at the end of the mound. There is also a mature acer, which we had to move, situated at the edge of the dividing path (between the lawn) on the field side of the garden. Would it be possible for you to suggest the names of suitable plants which I could purchase from you and which would compliment the existing ones. I am in my eighties and therefore need a very low maintenance garden. I would also like to introduce a little colour if possible. My garden is very exposed and is on quite a windy site. I look forward to your reply.